Presenting the artworks of artist Amarendra Moharana, from Odisha. He currently stays and works from his studio in New Delhi. (the car festival)of orissa, july 2008. “Confluence-II” An International competition and exhibition by Galerie Art Eterne. India Fine Arts & Crafts Society, New Delhi – 2003. 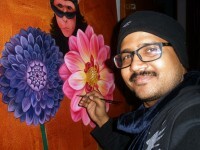 I, Amarendra Moharana, am an Artist from Odisha, staying in Delhi. I am working on children activities... my style of work is figurative and I use Acrylic on canvas. Center- 4 to 6th May 2008. "Happy Colors" A Group show Of drawings & paintings at Rabindra Bhawan, New Delhi. Nov.2007. Samskitiki- Art Festival, Keonjhar, Orissa..2000-2005. Kala Sampark –An exhibition of paintings,Barbil. Orissa-2001. First State Kalamela at Rastriya Lalitkala Kendra. Chitra Chakra –An exhibition of paintings by G.C.A.C. Khallikote at Rastriya lalitkala Kendra, Bhubaneswar. Jajpur Chitra kala mahotshav, Jajpur, Orissa.2003. Bhubaneswar, Rourkela & Puri - 2004. New Delhi in colaboration with Lalitkala Akademi, sikkim on march 2009. Rastriya Lalitkala Kendra. Bhubaneswar, Orissa-2002. Society, New Delhi – 2003.